Extra Specifications: Three year MFR's warranty. 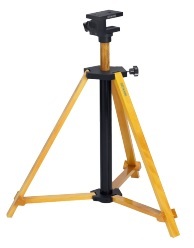 The Com-Power AT-812 collapsible tripod has been designed with high quality wood and nylon material. It is highly nonreflective and provides stability even for large antennas. It can be used for both indoor and outdoor EMI testing. The height of the antenna can be easily adjusted using the nylon center rod. It comes with various mounting accessories to cover all Com-Power antennas and many other brands of antennas as well. The ATTS-812 is the top support which connects to the Nylon center rod to mount some antennas directly as well as mount other accessories. The details of accessories are as given below.The bottom nylon piece can also be adjusted to achieve heights upto 1.5 meters. ATTS-812: Top Support Mounts: AL-100,ALP-100,ALC-100,AC-220,AH-8055,AL-130 ATHA-812: 90 degrees tiltable Antenna Mount Mounts: AH-118,AHA-118,AH-640,AH-826,AH-840,AHA-840 ATHP-812: Antenna Pipe Holder Mounts: AB-900,ABF-900, ABM-6000, AD-100 Three 1/4" x 20 threads knob screws.